The most awaited exam of the year for Clerk jobs - IBPS Clerk Prelims Exam is scheduled 08th, 9th & 15th of December 2018, if the one who is going to appear for this time then you have to finish off your preparation, its time for general revision & to relax your mind. You need not buzz your mind with plenty of questions about the exam. you’ve done your part with proper preparation and adequate practice. This is for the first time sectional timing has been introduced in the IBPS Clerk Prelims Exam. IBPS Clerk Prelims Exam will comprise of 3 sections, with a total of 100 marks and total time of 60 minutes. IBPS Clerk Prelims have shared that in the last remaining days, they were 100 percent focused towards performing well in the exam. Of course, being in a positive frame of mind also helps. During the last phase of preparation, aspirants should be dedicated and engrossed in their studies. Revise each and every topic thoroughly. These chapters might be time-consuming but they can fetch you maximum number of marks. Questions from these chapters appear in bulk and once you get these questions right, you can easily score enough to cross the cut-off marks. Do not aim for becoming a topper, Focus on giving your best shot. Aspirants should not take stress at any point of their preparations. Studying should be fun! Put all your hard work while studying. Do not involve yourself in those activities which hinders your study schedule such as social media, mobile phones etc. It is only your hard work which pays off in the end. Put 100 percent effort to achieve your goal. During the last day of your preparation, go back to your basics and strengthen the base concepts of each subject. Also, revise your self-made notes or study material given by your coaching institute. The nature of IBPS Clerk Prelims Exam demands clarity on concepts. Thus, it becomes highly significant to brush up your skills and revise each and every formula, theory and fundamentals. To avoid unnecessary tension, equip yourself with all the necessary documents. This point could not take a back seat in our checklist because it is the foremost thing to be taken care of the sooner the better. Take a print out your admit card and ID proof, and read the instruction of your admit card. 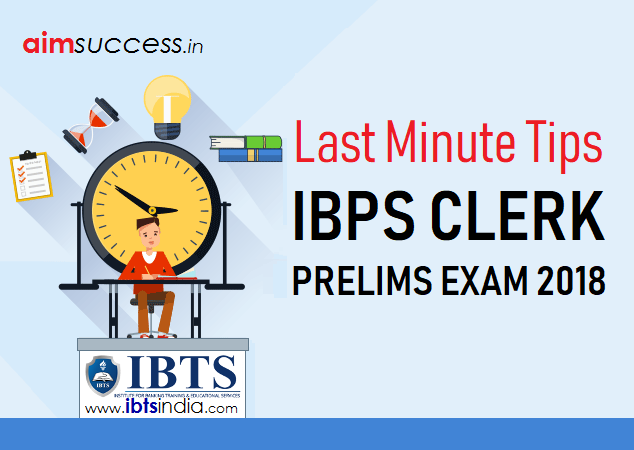 Last Minute Tips For IBPS Clerk Prelims Exam 2018 – As you all are aware of the IBPS Clerk Prelims Exam Centers List, reach your examination center at least 45 minutes before, so that you can reach there and relax for 15-20 minutes before taking up the exam. This could help you to focus well on solving the questions. Keep your stress levels low. It is good to worry about the exam but don’t let the stress and anxiety take over you. Exercise, indulge yourself in recreational activities and have nutritious food. This not only helps in controlling the stress levels but can also keep your emotions stable. It can be helpful and good to be fast and save time in order to solve 80 questions in just 45 minutes but you have to be wise and careful as well. Instructions or directions of a question are very important and you should read the instruction of every question you are about to attempt. What if it was something you’ve already practiced but asked in a twisted way! You can actually save marks by reading the directions carefully. You need to keep in mind that you have to do a decent number of attempts in both the sections of IBPS Clerk Prelims Exam 2018. 20 minutes for Reasoning and 25 minutes for Quant this can be your mool mantra of maximum time spent per section. Be careful while choosing what to attempt and what to skip. Your every move, your every decision will make or break your deal so it is very important that you choose very carefully what you are going to attempt in the examination. Don’t be tempted and get engrossed in any particular section or question for too long. You need to mark it on your mind that you have a fair time and you need to solve a decent number of questions in the time allotted to solve each and every sections. 0 minutes for Reasoning and 25 minutes for Quant; This can be your Guru mantra of maximum time spend per section. We often ignore simple questions in an exam thinking that we can easily solve them at the end. But, Simple or easy level of questions can be your saviour in RRB PO prelims, so don’t just get engrossed in the difficult ones. Read the instructions carefully, and attempt simple or easy level questions to gain plus points in your scoring bag. Take 2 trips if you wish, while solving the paper. At first attempt the questions you find easy to approach and solve. Finishing them off will boost your confidence and keep you at bay from any stress. After you are done with all that you could have answered easily, then go for the second trip and try to attempt the questions you feel you can do with a little extra effort. Well, it is quite probable you may feel you know the concepts to solve a question just too well yet you are unable to crack it in the exam time, so just skip it, and take another question. Skip a question if you feel it is too time-consuming or you might not be able to get it right, at the end you have to score enough to clear sectional and overall cut off. Let nothing kill your speed! There are 80 questions for mere 45 minutes so keep a track of your time and don’t get stuck anywhere. Avoid making ‘silly mistakes’, they’ll cost you a year. You’ve been longing for this opportunity to be a probationary officer. So on exam day keep at a bay from making silly mistakes. Carefully solve and analyse question, do not presume things, just read the direction and be careful as you will have negative marking. Get the thought of ‘cut-off for IBPS Clerk Prelims Exam 2018’ out of your head. If the examination is of an easy level, it will be for everyone else appearing on exam, so is the case even if it turns out to be of difficult level. This moment and in these days you should be practicing rather than quivering over the thought of cut off. First, concentrate on the exam and making a decent number of attempts according to its difficulty level. Rest things will fall into places. So don’t overburden yourself and refrain from diverting your concentration. Keep your calm and be confident. Your confidence will sail you through this recruitment. No matter what is the difficulty level you’ll face in the exam just stay calm and believe in yourself. With a composed mind you’ll be able to crack through the examination, so sleep well and don’t stress yourself out. If you’ll say ‘I Can and I Will’ nothing can stop you from achieving your aim. IBPS Clerk Admit Card 2018 , Download Prelims Call Letter! Stay tuned for IBPS Clerk Prelims Exam 2018 Exam Analysis & Questions Asked, Our team will be live on Exam Days and update you each and every aspects of exam.